Last time, we looked at a basic overview of utility functions and their importance as the foundation of any model of preferences over events with uncertain outcomes. Today, we'll take a closer look at specific utility functions and try to find one that is a good enough fit for a typical real-life person's actual risk preferences. 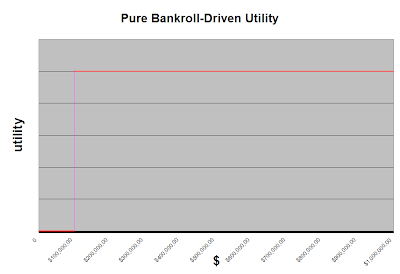 As long as the player has enough money in his bankroll to be able to play the stakes he wants to play (in this case, $100k), he is indifferent to the size of his bankroll. When he has less than $100k, he can't play his game of choice, and he has no utility. In practice, these extreme preferences are not too interesting and not too relevant. For one, if the player is willing to move down and play smaller stakes, then this utility function would decrease more gradually to 0 and may end up resembling a typical utility function anyway (perhaps exponential utility). More importantly, it is unlikely that any real-world player is driven purely by being able to play poker with an entirely separate bankroll; most players will be withdrawing money from their bankroll in some fashion and thus realizing traditional utility of wealth. 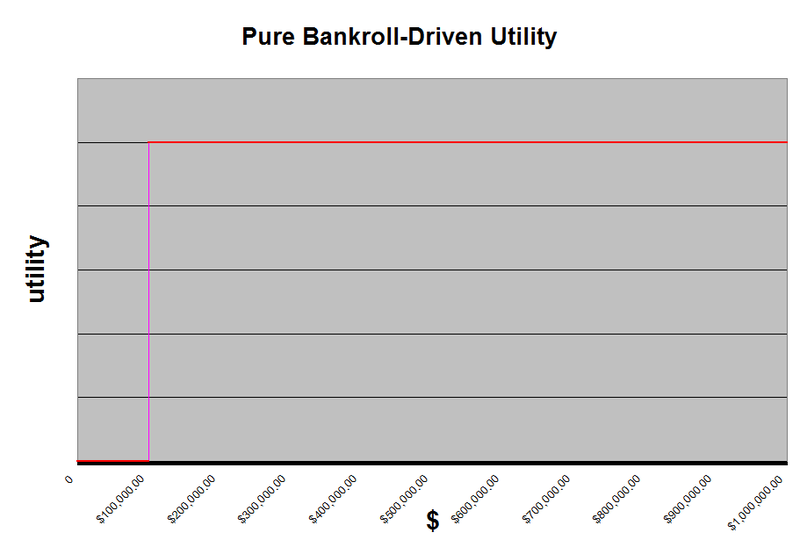 There may be some parameterization that could capture an individual's degree of "bankroll-driven-ness" in conjunction with his utility of wealth, but simply using the traditional utility function will likely be close enough to this for most people. So, going forward, we will ignore this consideration. 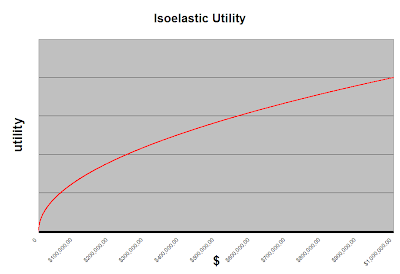 From our overview in part 1, the isoelastic utility function exhibited more desirable properties than the exponential utility function. It is worth checking out how good of a fit it might be when we look at opportunities where less than one's entire net worth is at risk. For any risky opportunity, under isoelastic utility, one's preferences do not change under a rescaling of one's wealth along with a proportional rescaling of the amount risked. With that in mind, let's explore some easy hypothetical scenarios involving simple bets on coin flips. If the results seem consistent with the risk valuations we would expect a typical player to make, then the utility function is a good fit. 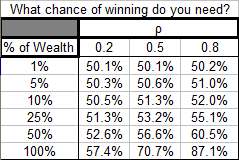 Here, we look at the certainty equivalents, expressed as a percentage of expected value, of risking a certain percentage of one's wealth (rows) on a fair coin flip when one has isoelastic utility with parameter ρ (columns). 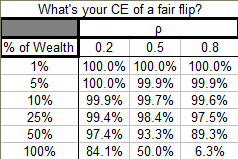 We observe that, for small enough percentages of wealth at risk, the CE of a fair coin flip is almost 100% of the expected value (it's rounded up in the table), which means that the individual is nearly indifferent between taking the coin flip and not. For larger percentages of wealth at risk, the certainty equivalents become significantly lower, especially for larger ρ. This quantifies what we would expect; higher risk aversion means a lower willingness to take large risks. The behavior is consistent with real-life preferences. When small percentages of the player's wealth is at risk, he is willing to take fairly thin edges, but he demands large edges to risk larger percentages of his wealth. The specific numbers in the table seem only partially realistic to me. One problem is that the typical person might be inclined to demand even larger edges for the smaller percentages of wealth at risk than those prescribed by ρ=0.8, but as will be noted later, there's not much that can be done about that with isoelastic utility. This is perhaps the most instructive approach to look at, as it is most intuitively matched with one's personal risk preferences. These all look fairly reasonable to me. No matter what value of ρ we choose (even if we made ρ very close to 1, as it turns out), the individual with isoelastic utility preferences is willing to risk 1%-25% of his wealth with very small edges. While this seems reasonable for individuals with small levels of wealth, this utility function cannot be fit to a wealthy individual who is still risk-averse for small percentages of his wealth. If we want to use isoelastic utility, we have to concede this point and understand that our model will produce an individual who is willing to accept thin edges for small percentages of his wealth, regardless of his level of wealth. We might want to have the utility of near-zero wealth (bankruptcy) approach negative infinity if it would be impossible to ever accumulate any more money to start again. Instead, we'll implicitly assume that our individual has some outside source of income that could eventually restart a depleted poker bankroll. One practical modification that I thought might be important would be to change the utility function to account for various "class levels" of subsistence income. For example, $10,000 might be the minimum amount of wealth where an individual could barely scrape by for a year. Or, as some research suggests, an annual income of $75,000 may be "enough" to be happy in the U.S., and the marginal happiness-return on higher levels of income are greatly diminished, so there might be increased importance on hitting that level of income and less importance on getting any more than that. 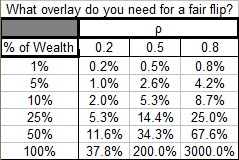 Either of these effects could suggest that a good, practical utility function needs to be defined piecewise over these different regions of wealth. The isoelastic utility function doesn't capture this. Ideally, we could construct a utility function which essentially varies the ρ for different levels of wealth, or at least between a few major regions of wealth. All of the above observations exploit the property of isoelastic utility to be able to look only at the percentage of wealth at risk, but in practice, we might expect these risk preferences to vary with the level of wealth. For example, the numbers for ρ=0.6 seem about right for my risk tolerance if my net worth were $10k, whereas something like ρ=0.8 seems like a better fit if my net worth were $100k. Preferences over having a certain level of risk tolerance as a function of wealth can be captured by varying ρ, and it seems to take a fairly drastic change in personal wealth to create inaccuracies in the choice of ρ. In practice, an individual looking to model his utility with this utility function could find the ρ that fits him best and simply reevaluate and update it every year. This will only be a big issue in cases of sudden very large payouts, such as a small-stakes player winning the WSOP Main Event. So we might expect our utility function to underestimate our risk tolerance for large risks. We can account for this by erring on the side of choosing a higher value for ρ, especially when considering an opportunity with large possible gains or losses. We're also ignoring all psychological or behavioral effects. For example, prospect theory might dictate that we modify our utility function so that losses hurt more than wins. Next time, in Part 3, we conclude by incorporating U.S. income tax considerations.